I’m not a morning person, so breakfast is rarely on my top fave list. My groggy brain gravitates towards easy preparation, so pre-packaged cereals would be an easy answer. Except that I’m so picky about the ingredients: too much cinnamon, nuts that I don’t like (walnuts and pecans have no place in cereals or breads, AFAIC), and coconut where it’s not wanted. But then inspired by Deborah Madison’s recipe from Vegetarian Cooking for Everyone (Broadway, 1997), I found that homemade granola is amazingly easy! I usually use a mix of chopped almonds and cashews, but of course you can substitute different kinds of nuts. One of these days I’ll try dried apricots or prunes instead of raisins for a change; I wonder what other dried fruits would work well? If you can’t find golden syrup (which is a specialty item here in the states), barley malt syrup works, although it seems to burn easily, so lower the oven temperature to 300F, and/or reduce the baking time by a few minutes. Brown rice syrup is also a good substitute. I’ve tried using maple syrup instead of honey, but it seemed to lend a bitter taste; also replaced golden syrup once with agave syrup, but it made the granola too sweet. Dried apricots, even Blenheim slabs, seemed a bit too tart for me. But that might work for you, if you prefer a more zesty flavor. Dang, there can be a lot of scraping involved, in spite of using a non-stick jelly roll pan. A workaround I found is to line the pan with a silicone mat, like the ones by Exopat or Silpat. Prevents most sticking, yet allows desired browning. A great kitchen gadget! Need a gluten-free alternative to wheat germ? Use a nut meal, such as ground hazelnuts or almonds. 1 1/4 cup chopped nuts, such as almonds, cashews, etc. 1/4 to 1/3 cup golden syrup; alternatively, use barley malt or brown rice syrup. In a large bowl, stir together all of the dry ingredients except for the raisins. Mix the oil, honey and golden syrup in a small jug, then stir the liquid into the dry ingredients. Stir and toss until the grains and nuts are coated. Evenly spread out the granola onto a non-stick pan: a jelly roll pan (about 13 by 18 inches) with short sides works well. You’ll stir the granola with a flat, heat-proof spatula twice during the baking process, which will last for a total of 31 to 37 minutes. So, initially bake for 13 to 15 minutes, then stir the granola. Bake for another 9 to 11 minutes, and stir again. Finally, bake for another 9 to 11 minutes. Update (15 Sept 2009): After some experimentation, I’ve found that I can get away with stirring the granola only once in the middle of baking. 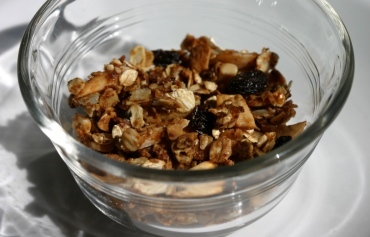 Stir in raisins when you store the granola in an air-tight container. (Or just toss ’em in when serving.) Serve with milk, yogurt, fruit and/or ice cream. This was written by sairuh. Posted on Tuesday, November 28, 2006, at 11:00 am. Filed under Food. Tagged almonds, breakfast, cashews, cereal, grains, recip. Bookmark the permalink. Follow comments here with the RSS feed. Post a comment or leave a trackback. I like honey in homemade granola, especially high-quality honey. Maple syrup sounds a little odd. Also, other kinds of dried fruit are good. The dried apricots I recently tried seemed both too sour and sticky. Strange, since they were Bleinheims.